My Perfect Vanilla Bean Iced Coffee. So we have a few things to chat about today. First is most definitely this vanilla bean iced coffee that I am beyond excited to share with you guys, second is the matter that I was just informed that I could possibly be the ONLY person around when the goats have their kids, and third…wait there was only two things, but both are well, WHOA. OK, so let’s start with the goats. Like what? How can I be the only person around when all three are due to give birth? I mean, we don’t know for sure when the goats will give birth, but if calculations are correct, there’s a really good chance they will deliver somewhere around September 15th (also my birthday). It also just so happens to be the same weekend as the Portland wedding of a long time family friend (you’ve all heard me mention the Mooneys). Therefore, the entire family is of course going to attend… well except me, I will be knee-deep into my cookbook photo shoots…and apparently taking care of the goats. YOU GUYS. What on Earth am I going to do with a bunch of baby goats all by myself? Oh my Gosh, freaking out a little bit here. Clearly I should start doing some research on birthing goats… but really my fingers are crossed that the births just do not happen during those three days. Knowing me though, it will totally go down that way. Alright, so freak out session over. Let’s talk about my perfect vanilla bean iced coffee!! As a lot of you guys may know, I really only started drinking coffee this year, and the only way I can drink it, is if it’s steaming HOT and black. I don’t like cream or sugar. Or well, I’m sure I probably would, but since I don’t want to have my dessert in the morning (I save that for later in the day), I go with black. With iced coffee though, it’s a little different. I love a cold, creamy coffee, heavy on the vanilla, lighter on the sweetness, but still just sweet enough. Simple, but like GOOD! Enter this iced coffee. Personally, I’m all about this in the afternoon. I am not big on cold drinks in the morning, maybe this is because I don’t live in a super hot place, I just prefer something warm in morning. But something cold in the afternoon totally works for me. Also, it’s kind of a sweet treat and the perfect four o’clock pick me up! Here’s the deal, when it comes to an everyday drink like iced coffee, I think it should be simple. So I make a cold brewed coffee with fresh coffee beans and coconut water. I like the coconut water for the slight kick of flavor, but when that’s not around, I just use regular water. So I brew that overnight. I also make a quick vanilla infused coconut milk the day before as well. I like using coconut milk, but I also LOVE to use goat milk. However, since the goats are preggers right now though, our goat milk production in non-existent. So coconut milk it is! Of course you can use cow milk or any other nut flavored milk as well. It’s the vanilla beans that are super important here, as they give the coffee that perfect vanilla flavor. Another thing I like to do is make coffee ice cubes. I cannot drink watered down coffee, it has to be kind of strong, so the coffee ice cubes are kind of a must for me. 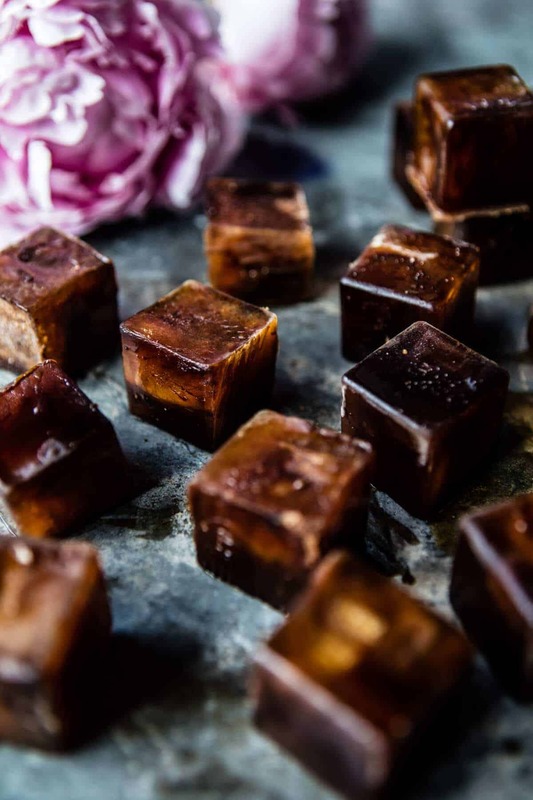 When I have a few extra minutes, or am feeling a little fancy, I’ll quickly freeze some chocolate coffee cubes. YUM. Three parts… one awesome iced coffee. Convinced yet?!?!? I hope so cause I think it’s time for a little pick me up? Yes, for sure. It's kind of a sweet treat and the perfect four o'clock pick me up! Grind you coffee beans, then add them to a large pitcher or bowl. Pour over 4-5 cups of coconut water (what I like to use) or water. Stir gently to combine and then cover with a piece of cheesecloth or a kitchen towel. Let sit a room temperature for at least 12 hours or up to overnight. Strain the coffee through a mesh strainer lined with a piece of cheesecloth. Chill in the fridge for up to 1 week. Combine the coconut milk, vanilla bean seeds and honey in a small sauce pan and bring to a low boil. Simmer 3-4 minutes, then remove from the heat, cover and steep 10-15 minutes. Transfer the milk to a glass jar and store in the fridge for up to 1 week. 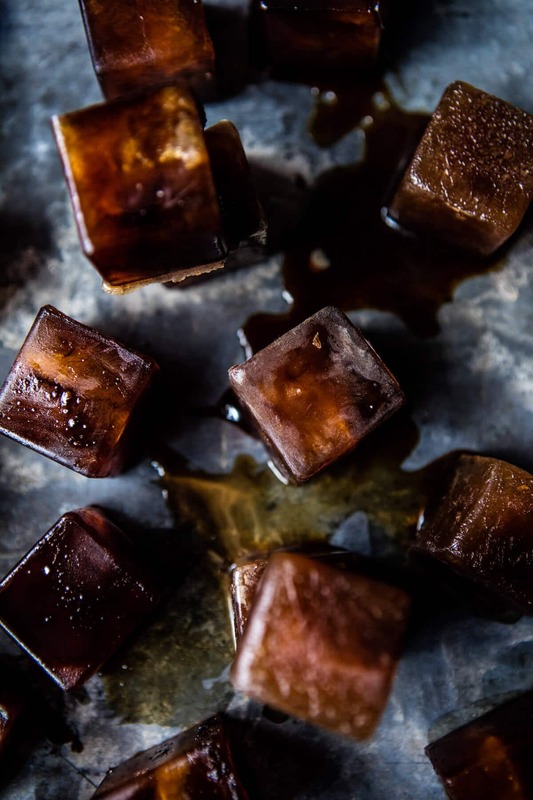 Fill your glass with ice cubes (or Chocolate Coffee Ice Cubes - recipe below), pour your cold brewed coffee overtop. Add the vanilla coconut milk to your liking. DRINK! In a 4 cup glass measuring cup, whisk together the coffee, cocoa powder and honey until combined. Divide between ice cube trays and freeze until frozen. Use as desired. Wait, with a side of cookies too please? OKok. ?? This looks perfect! I can’t wait to try it! 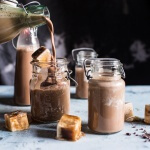 And the chocolate coffee ice cubes sound genius! Do you think those would work as ice pops? Love this!!! 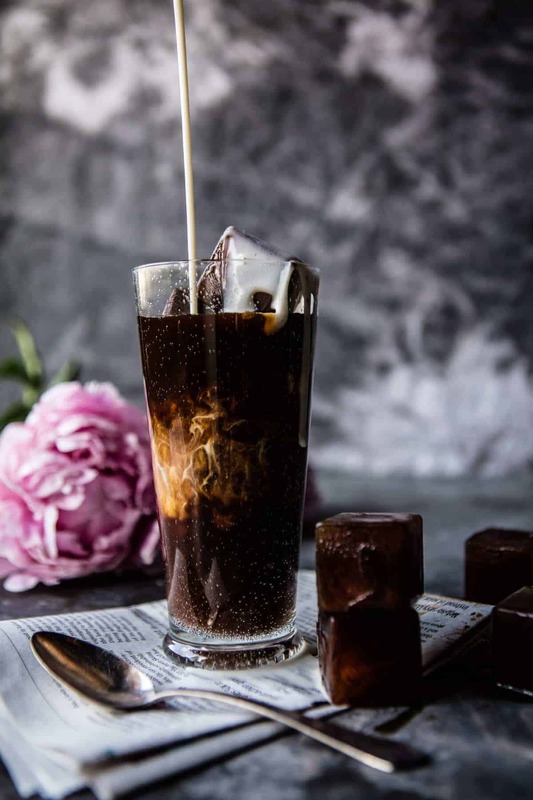 The chocolate coffee ice cubes are such a good idea and I love that you brewed your coffee with coconut water. And those shots are amazing! Bet you were buzzing all day but it was definitely worth it 🙂 stunning! I can never drink coffee after two in the afternoon, or else I simply won’t slep at night!! This sous like something I will have to wait until the pak of Summer to try, but try it I shall!! Well I hope you love it when you try it! Thanks Miranda! This looks delicious! Good luck with the kids too! You nailed it with the 4’o’clock pick me up. As a teacher, I’m up at 6 am and heading to work but home by 3…..and guess what I need to get that honey-do list done. Yup. Wife thinks I only work half days and gives a whole heckofa lotta work to do. So obviously need this. So true! Perfect for you then Tom! Hope you love them! Thanks! So funny you had to shoot these pics so much, since I was just thinking “damn, she did it again, those pics are DOPE” .. I’m kind of exhausted the first time I shoot actually!!! Sometimes you just gotta shoot a TON! I hope you love them Eva! Thank you! It has been iced coffee all day everyday since last week and will continue all summer now! Right! Glad were on the same page! Beautiful photos! The main reason I add half-and-half to my ice coffee is to see that swirl of white goodness coloring the coffee. It’s part of the experience of having ice coffee. The Japanese say that you eat with your eyes first….so true! Haha! Seriously the most fun part! Especially for shooting! Thanks Joan! Hope you enjoy! I LOVE iced coffee ! But I never thought of doing it with coconut water, now that you’ve stated it, it make perfect sense and sounds delicious ! Also, you’ll have to keep up updated on those upcoming baby goats !!!!! I hope you love the coffee though Erika!! Thanks! This looks AMAZING! Just what the doctor ordered when trying to come back after a long weekend. Question – if we’re using coffee grounds (vs. measuring whole beans first) to make the cold brew, what’s the measurement? I too would love to know this. Tried Google but got nothing ? HI!! I would say to use about 3/4 A cup ground coffee! Sorry about that!! Hope this helps! I would say to use about 3/4 A cup ground coffee! Sorry about that!! HI!! I would say to use about 3/4 A cup ground coffee! Hello afternoon pick-me-up! So need this today! Thanks! YAY! Hope it was A great afternoon Trina! Thanks!! COCONUT WATER COLD BREW COFFEE WHAAAAAAAAT. 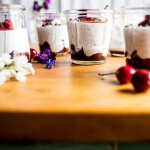 This recipe is divine and I can hardly wait to make it. I thought I might be done with coffee for the summer, but NOPE. LOL! I don’t know if its possible to be done!! Hope you love it Kate! Thanks!! YUM Tieghan! This looks so good and I am not even a coffee drinker, but I could probably be one with one of these. Thank you Shannon!! It’s a slippery slope but possibly the tastiest! Um, yum!! 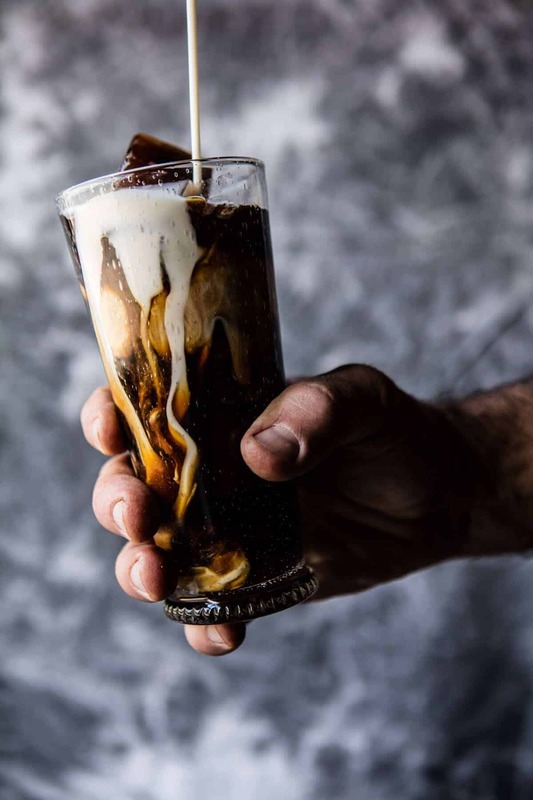 I already have cold brew in the fridge, this iced coffee is totally happening this weekend! YAY! Hope you love it! Thank you! I’ve tried to like coffee…but really think it smells & tastes awful. This does look really good thou, might have to give it another go. Don’t worry about the goats, they know what to do. Hopefully it will happen while your on watch & it’ll bring you all the closer to the cycle of life. I think it was one of those things I forced myself to drink and eventually started loving it! Lol! As for the goats I will be keeping my eye on them as we get closer to that time! 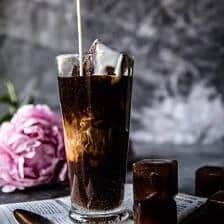 Iced coffee is the best and those chocolate coffee ice cubes are just brilliant! No more watery room temperature coffee (: Haha! Thanks Laura! This looks incredible!! 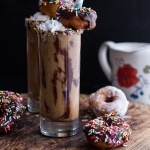 I need to make this..I am obsessed with anything vanilla and coconut, and iced coffee is the best! Also, these photos are incredible..you never cease to amaze me. Love the GIF too! Sounds like you will love it!! Let me know!! Thanks so so much Molly!! I’ve found a love for GIFS!! this looks amazing and your photography is AMAZING! love the blog! I have to say that I was super excited to try this recipe and made it as soon as I had the chance. 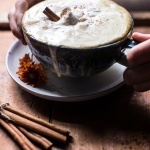 I was a bit disappointed with the coconut milk; I followed the recipe exactly, but after chilling the vanilla infused coconut milk, I couldn’t incorporate all of the chunks of solidified coconut milk, even after shaking it again. I was left with chunks of it in my iced coffee which still tasted good, but looked less than appetizing. Do you have any tips on how to avoid this in the future? Oh my gosh, I am so sorry. That is SO weird. What kind of coconut milk did you use? I have no idea why it would be clumpy like that, I have never had that happen. I am sure you did, but you heat the milk on the stove first, right? Maybe your milk got too thick? did it seem thin or thick? You could try adding a little water if that is the case. Let me know and I will try to help anyway I can! So sorry! Unsweetened coco powder or not in the coffee iced cubes? Hi!! Use unsweetened coco powder! Thanks! Hey Melissa! It makes 1-2 servings. Thanks! 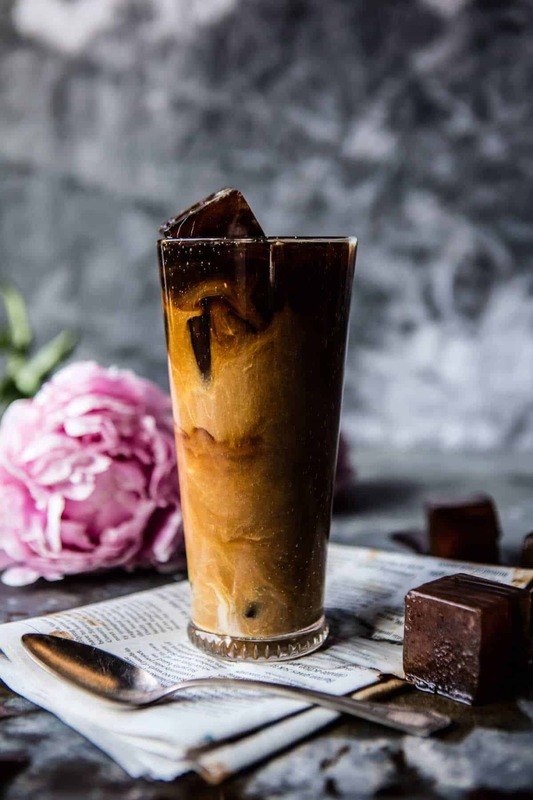 I cant wait to try this recipe… i have been using coffee ice cubes for about 15 years now but never thought to try coconut water! See my jaw has been wired shut for the past 4 weeks and still have atleast 8 more to go so ive been living off iced coffee to keep from wanting to sleep all the time…. Definitely doing this recipe today!! Yes! Try this, I hope it is great for you Dena!! ? Can you use vanilla instead of vanilla bean seeds. It is 1 tsp of vanilla instead? 2 tablespoons of vanilla bean seeds seems like an awful lot of vanilla beans…and those are pretty expensive. Is that accurate?? So sorry about that! That is a typo. It’s 1 vanilla bean or 2 teaspoons vanilla extract. Let me know if you have questions. Hope you love this coffee! Hello! Looking forward to trying this!!! What grind size do you need for the coffee? Same grind as a french press? Hi! I totally agree, but I love making this ahead of time and using it every morning for a treat! I hope you try this!